Hmm. What can we glean from this illustration? 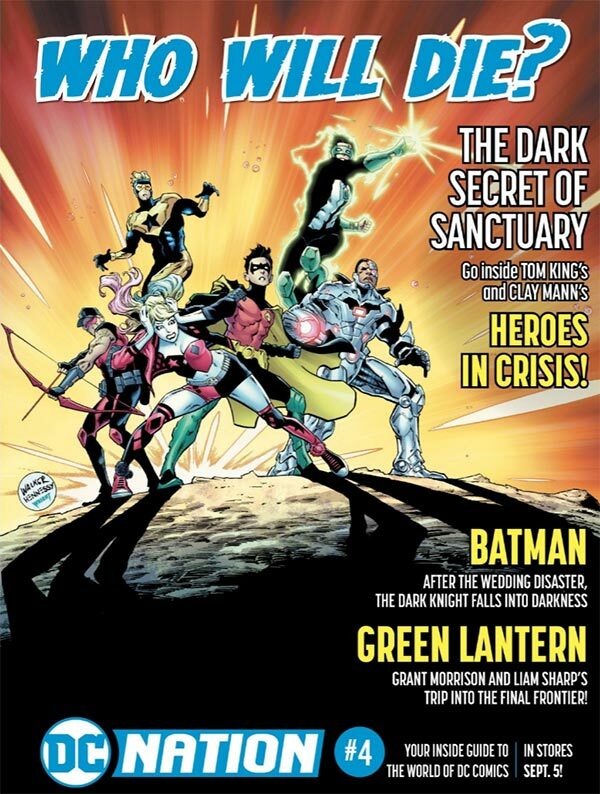 At last month's Comic-Con, Dan DiDio and Tom King teased that one of the two much discussed "deaths" of Heroes in Crisis will be a Flash, who is conspicuously absent from this ad. Is the other doomed hero one of these characters? I still hope it's not Booster! I'd be remiss in my duties as unofficial chronicler of Booster's official chronicles if I didn't make note that the art for this piece — a future Heroes in Crisis cover? — was drawn by Brad Walker and inked by Andrew Hennessy. So far as I'm aware, this is the first time either has illustrated Booster Gold. Comparatively, colorist Jason Wright is an old hand, having colored Booster appearances twice before! Perhaps DC will be willing to spill some more details in the next issue. They'll have time. DC Nation #4 is scheduled for a September 5 release, whereas Heroes In Crisis #1 won't be available until September 26. If Booster Gold had two dollars and earned nine more, how many dollars does he have in all? If there were nine villains, and Booster Gold defeated three of them, how many villains remain? There have been 2063 blog entries since January 2010.